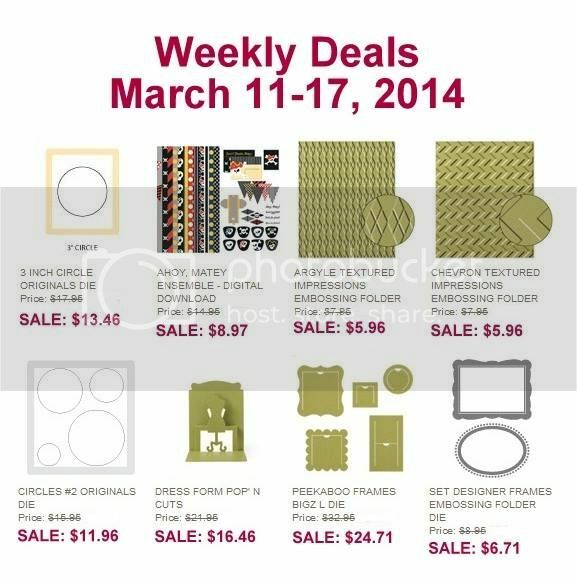 Great new Weekly Deals are here for 3/11 -3/17...if you are a Big Shot lover then you will love these weekly deals! Also available today are two new Photopolymer sets called Sweetie Pie and Sweetie Pie Frames. You can purchase them separately but why would you want to do that when they work so well together! The Photopolymer sets are becoming some of my favorites...I like them because they cling so well to our clear blocks, they are inexpensive and I like that I can see where I'm stamping. If you've never tried them before now is a perfect time to do so...but don't wait too long I have a feeling that this set will sell fast!